Housing Analog BLOCK Module witch 8 Analog-In ,4 Opto-In, 4 Relay Outputs; Serial Line RS232 or TTL, RS422/485, Current Loop;1 I2C BUS line, 1 Serial Line USB or CAN; Power Supply. The SL-Data is a comfortable Data-Logging product that saves on S-LOG the data obtained by GAB H844 Analog Inputs. The SL-Data GSM is a comfortable Data-Logging product that saves on SDI 02 the data obtained by GAB H844 Analog Inputs + GSM Modem. 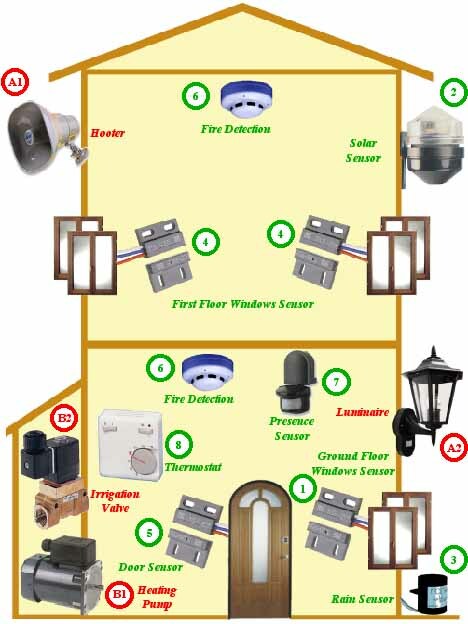 House Automation Example. Connection of Sensors and Actuators.